The Dears have announced the release of their seventh studio album, Times Infinity Volume Two, due July 14, 2017 through Dangerbird Records. The album is the second instalment of a two-album project from the Montréal band. Following a six-year absence, the band made their return to the UK earlier in 2017, with the much-applauded release of Times Infinity Volume One and a run of sold-out UK & Euro live shows (the band's first since 2011), including London Village Underground. Volume Two sees the completion of a body of work which founding members Murray Lightburn and Natalia Yanchak recorded over a two year period between Toronto's Revolution Recording and Montréal's Thee Mighty Hotel2Tango. Speaking about the process, Lightburn says of the final mix sessions for Volume Two: "At the hotel2tango, it had been a 20 hour day. I worked deliriously towards finishing Volume Two. In part it was because I knew precisely how it was all supposed to fit together but mostly because there was another band's session coming within just hours. It really recalled those overnight mixing sessions for No Cities Left, complete with a fresh-faced Howard (studio co-owner Bilerman) arriving in the morning, coffee in hand, asking, 'how did it go?' I still don't really know. But I did my best." Both Lightburn and Yanchak identify Volume Two - a record driven by an unmistakable sense of unease - as the comparatively darker component of the Times Infinity series. The Dears have majored in bristling honesty throughout their 25 year-strong career, and Volume Two is no less candid, with the microscope turned on Lightburn and Yanchak themselves. Fractious early single ‘Of Fisticuffs' typifies the universal, everyday tightrope of choosing which battles to fight. For Lightburn and Yanchak - married with a young family of their own - a sense of protecting what's important runs deep through the album, though rendered with disarming tenderness. Look towards the expansive vocal from Lightburn which anchors the elegiac ‘Guns Or Knives', wringing classic Dears-esque uplift from measured angst. Fragile album-opener ‘Taking It To The Grave' takes its fatalistic title at its word, with Yanchak's plea, ‘If I don't get home to you', giving way to twitchy guitar loops and a billowing post-rock coda. Speaking about the track, Lightburn says: "At a certain time in one's life, along comes a feeling of having something to lose. There is a tragic narrative in this song, one that is unresolved. It is sad when you suddenly don't have the chance to say things to someone because they are no longer there." Volume Two doubles down on the propulsive agitation of Times Infinity's first instalment (see the driving baselines which propel ‘Of Fisticuffs' and the nervy jangle of ‘1998'), and finds Lightburn and Yanchak perfecting Sixties-imbued Volume Two doubles down on the propulsive agitation of Times Infinity's first instalment (see the driving baselines which propel ‘Of Fisticuffs' and the nervy jangle of ‘1998'), and finds Lightburn and Yanchak perfecting Sixties-imbued moments which are as understated as they are involving. Working album-title track ‘All The Hail Marys' has Lightburn coming on all soulful beneath shimmering organ pedal notes and widescreen strings, whilst the languid, cyclical grooves of album-closer ‘End Of Tour' looks back on the close of a previous UK tour, some six years earlier. The lightest touch of all comes on tracks like the delicately nuanced ‘I'm Sorry That I Wished You Dead.' Lightburn describes this one as: "One of our more funny yet brutally honest songs. Sometimes people get extreme feelings that they need to get out. This is one of those times. Rather than have the production reflect that, we took a slightly Velvet Underground approach on this one the rumbly Moe Tucker drums and drone-y jangly guitars. There's the refined element of restrained strings that's really carrying a lot of the weight." 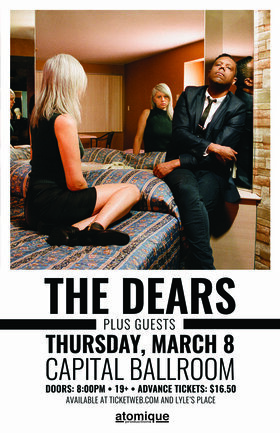 The Dears emerged out of the early Noughties Canadian indie renaissance, cementing their orchestral-pop- noir sound with celebrated debut album End of a Hollywood Bedtime Story, in 2000. In 2001 and 2002, they released the EPs Orchestral Pop Noir Romantique and Protest, as well as a collection of unreleased songs, Nor the Dahlias. In 2003 they released their second full-length album No Cities Left, and a string of highly anticipated shows at SxSW '04 launched their international career. Gang of Losers was released in 2006, was well received by the press, and was shortlisted for the Polaris Music Prize. A tumultuous transitory period followed. The Dears emerged, stolid, with another meticulously crafted classic, Missiles in 2008, and later 2011's Degeneration Street.